ATLANTA, Ga., September 14, 2018 /3BL Media/ – Aflac, the leader in voluntary insurance sales at U.S. worksites, today delivered the very first My Special Aflac DucksTM to the Aflac Cancer and Blood Disorders Center of Children’s Healthcare of Atlanta. My Special Aflac Duck, designed by Sproutel, is a social robot that uses medical play, lifelike movement and emotions to engage and help comfort kids during their cancer care. Today’s inaugural delivery follows more than 18 months of child-centered research conducted with children, parents and medical providers at the Aflac Cancer Center. 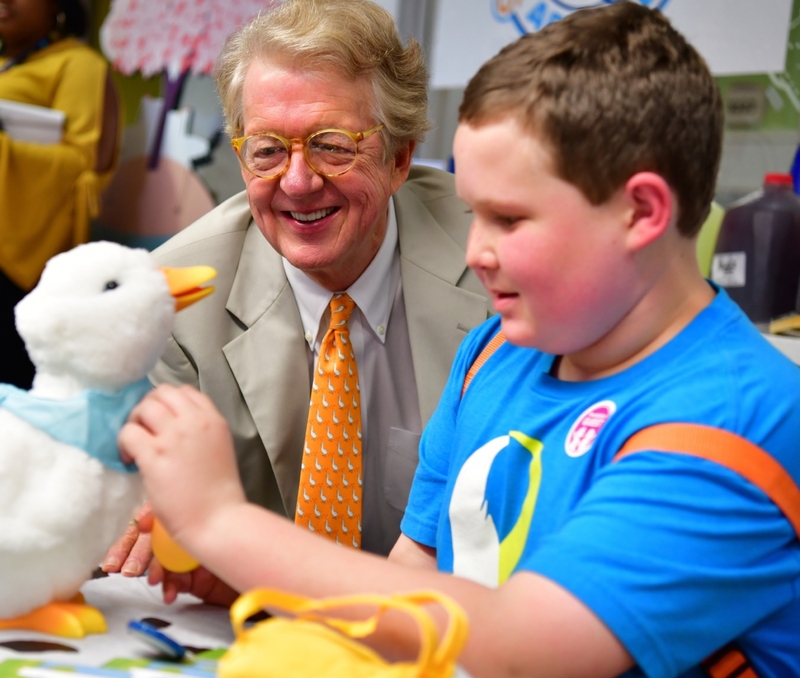 At the delivery event, attendees were treated to a demonstration of My Special Aflac Duck, showcasing how it will help comfort children and serve as a tool for health care professionals to help their patients through difficult treatments. After the demonstration, children and their parents were sent on a fun scavenger hunt, finding clues and visiting various locations throughout the hospital, eventually leading them to the discovery of their very own My Special Aflac Duck. “The first chance to see My Special Aflac Duck in the arms of patients makes today a red letter day. To expand the Aflac Duck’s role to that of a tangible companion through the cancer journey of brave and special patients here and beyond is a wonderful opportunity for our duck and for Aflac,” The Aflac Foundation, Inc. President Kathelen Amos said. Later this year, Aflac will expand its My Special Aflac Duck campaign to hospitals across the country, providing a My Special Aflac Duck to any newly diagnosed child, ages 3-13, free of charge. Emotional expression: Seven RFID-enabled feeling cards help children communicate; the duck acts out a given feeling when that feeling card is tapped to its chest. Medical and nurturing play: A chemotherapy port allows children to mirror their care experiences via play, giving them a sense of control during the process. The duck’s no-cost companion app allows users to “bathe” it, “feed” it and give it “medicine” via augmented reality. Convenience: A removable skin, which can be washed to adhere to hospital hygiene standards. Since 1995, Aflac has contributed more than $125 million to the pediatric cancer cause, including more than $500,000 donated each month by 17,000 independent agents licensed to sell Aflac products. The funds are committed directly from their monthly commission checks. To see My Special Aflac Duck in action and to learn more about this important cause, please visit AflacChildhoodCancer.org. When a policyholder gets sick or hurt, Aflac pays cash benefits fast. For more than six decades, Aflac insurance policies have given policyholders the opportunity to focus on recovery, not financial stress. In the United States, Aflac is the leader in voluntary insurance sales at the worksite. Through its trailblazing One Day PaySM initiative, for eligible claims, Aflac U.S. can process, approve and electronically send funds to claimants for quick access to cash in just one business day. In Japan, Aflac is the leading provider of medical and cancer insurance and insures 1 in 4 households. Aflac insurance products help provide protection to more than 50 million people worldwide. For 12 consecutive years, Aflac has been recognized by Ethisphere as one of the World's Most Ethical Companies. In 2018, Fortune magazine recognized Aflac as one of the 100 Best Companies to Work for in America for the 20th consecutive year and included Aflac on its list of World’s Most Admired Companies for the 17th time. Aflac Incorporated is a Fortune 500 company listed on the New York Stock Exchange under the symbol AFL. To find out more about Aflac and One Day PaySM, visit aflac.com or aflac.com/espanol.